June 15, 2017, 12:55 p.m.
New YouGov research highlights just how badly the election campaign and result damaged the public’s view of both the Prime Minister and the Conservative party and how much it boosted Labour and its leader. In April, Theresa May had a healthy net favourability rating of +10. At the end of May, following the campaign and negative reception of the Conservative manifesto, it fell to -5. Following the election result it has plummeted to -34. The Prime Minister is currently about as unpopular as Jeremy Corbyn was in November last year, when he scored -35. Meanwhile, the Labour leader has experienced a remarkable turnaround in public perception. 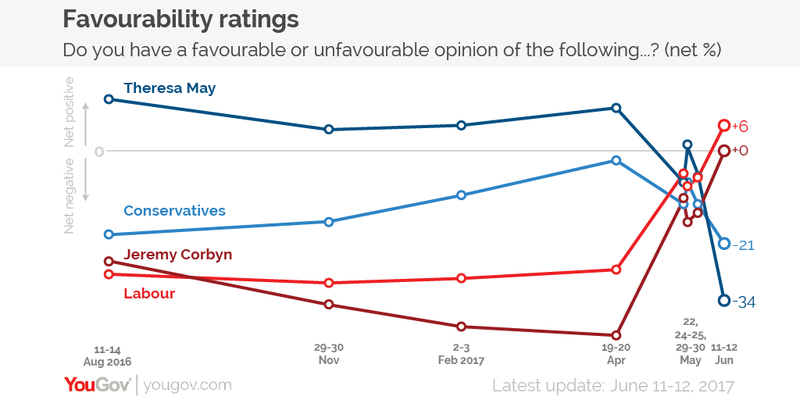 Having experienced increasingly worse favourability ratings since Theresa May took office last summer, Jeremy Corbyn sank to a low of -42 in late April, just after the election was called. However, the public’s view of the Labour leader improved markedly over the campaign, reaching -14 in the last YouGov favourability survey before election day. Now, following the result, his net favourability score is +0 – meaning that as many people now have a favourable view of him as have an unfavourable view. The results clearly chart how the Prime Minister alienated a big section of her voter base. While Theresa May was seen favourably by 85% of 2015 Conservative voters in late April, by mid-June this had fallen to 57%. By contrast, over the same timeframe, the proportion of 2015 Labour voters with a positive impression of the Labour leader rose from 40% to 75% as Corbyn won them round. He also experienced a huge improvement among 2015 Lib Dem voters, rising from 15% to 69% over the course of the campaign. It is remarkable that there has been such a sharp turnaround for the leaders of the two main political parties. When the election was called, Theresa May was secure in her position and many were speculating over the future of the Labour leader. Now, the roles are reversed, with Jeremy Corbyn having silenced his critics and won over large sections of the public while the Prime Minister faces criticism from across the board.